I have another order going out tomorrow for 25 more wine bottle chopping blocks and this time I didn't get to build them. I have been in the paint shop and the office a lot. Finishing cabinets to match is a little tricky, but I will get it soon enough. What a crazy day Saturday was? I want to say thanks to all my "new" followers and those that have been with me from the beginning you have a special place in my heart. It was a nice day of great encouragement I could not ask for more. All the nice comments on my blog were so much fun to read! And I even got some new ideas offered to me. Now I am off to the finish shop to primer a cabinet that is to be picked up tomorrow! Everything seems to be up to the very last second. Oh and I did get some orders this weekend! One is in West Virgina, and another in Massachusetts! And another in Minnesota. What a great thing the internet is! I saw your story on aol and began reading your blog. I just want to say congratulations! Also you have so many great things in here. I love that you are giving the credit to Jesus! I also love that you took a risk, stepped out in faith and God totally blessed that! So many times, we wait for people to come to us. You took the chance, submitted your work, called to check-in and then you were told you would have to wait a lot longer. But the huge thing is that you did your part! And then you wrote that instead of waiting for the phone call from WS, you began looking for more opportunities to sell your product. I don't know much besides you come off as talented, hardworking and faithful, and I believe God is blessing you for your work and obedience. You go girl! I'm praying that His blessings keep coming to you and your family! 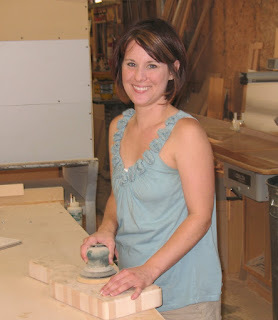 Nice to see another wood working woman out there! I have been doing woodworking since the 1980's. It is a very difficult economy right now and I looking for that "special thing" to create to possibly sell on the web. (something that I have never done) You can visit my Blog "Barnhart Fine Woodwork and Small Green Homes" or visit my Facebook Page with the same name. also and nowhere to go with them. I too saw your story on AOL today. I just had to read it because my maiden name is Morse. Congratulations to you and your business for stepping outside of your comfort zone. I hope your business thrives! God bless. Congrats on your new product!! I have owned a casework cabinet company as well as a corp. that mfg. products for the const. industry as well as the marine ind. I sold to Bass Pro Shops as well as develpment for Home depot. I just want you not to read some of the stupid comments on Aol site. They no nothing of the cost of production, mat., also I am sure Williams Sonomas price was also in the $129.00. I am aslo a John Boos dealer so you have a good product at a more than fair price. So don't let the great unwashed sway you, be proud you have saved your company many have not. I have men working for me who worked for me 25 years ago lost their own businesses and very happy to be working for me now. You go girl! Congratulations! When the walls fell down you rebuilt them with spare parts! I wish you continued success and BIG sales! Congrats to you! As the girl raised by self employed parents & now married to a homebuilder, I understand how hard it can be during times like this. I wish you only the best & much continued success. Congratulations! I was so excited to read about your success on aol! Way to go! Best of luck to you! I wish you much success! I too read your story on AOL and was happy to hear a success story of a strong and determined woman. When the chips are down, it's our job to make things whole again. It was great to read about your success on aol. I want one of those cutting boards! How soon will it be available at WS? I went to their website but did not see your cutting board yet. Keep those great ideas coming and good luck to you! Funny thing is I am from Pleasanton, just a hop skip and a jump from Lodi. I wish you and your family business all the success in the world. Small business america keeps the wheels turning in this ecoomy. William Sonoma made a great call. Keep up the great work. I too read the story on aol and have nothing but good wishes for your company's future. branch out and make butterfly, rooster, cow, and frog cutting boards for more sales. alphabet letters could work too! I just read your story on aol. So nice to hear good news in this economy. Leave it to a woman blogger to fix the world. You go girl!!! Just read your story on AOL.. That's awesome! So glad you were able to make something to help out your company and what an inspiration! I love those cutting boards they are beautiful! I hope to own one soon. Keep up the great work. I see great success in your future! Boy if that doesn't put a smile in your heart! Read your story on AOL and how awe inspiring. I am a Realtor and have felt the effects as well. This has been my worst summer in real estate in 11 years. I am so glad that you are giving the glory to God for it is He who gives us all that we have and provides for us, year in, year out. My dad was in the construction business many years back and I remember growing up falling on hard times, so I feel for your family. I'm just glad you lean on the one who is the Great I am!! May God continue to bless you and your family! What a wonderful story. Nice to see good things happen to good people.